Our Rail Operators are committed to safe work on all projects. They require contractors to comply with a systematic approach and understanding of risk and managing safety before they can access the rail corridor. All contractors must complete a 100 point identity check and provide evidence of their qualifications and certificates before they’re issued a RIW card and allowed access to the rail corridor. Evidence of qualifications and certificates will only be accepted if they follow the requirements set out by the Australian Skills Quality Authority. Information on the format accepted by the RIW program is available on the ASQA website. The process is outlined below. For detailed user guides, visit the Qualifications and Documents page. Step 1 > The Rail Industry Worker System can be found by clicking Register/Login at the top of this page. If your company isn’t already in the Pegasus Onsite system, you must enter your company ABN and details to register for an account in the Rail Industry Worker System. Once approved, you will be emailed your login details. You can now add and edit your employees in the Rail Industry Worker System – this includes personal contact details, address, phone and email. Now that you have entered your employees in the system, you can pay for their subscriptions and order their Rail Industry Worker cards. Cards cost $100 + GST and are valid for 10 years. The annual subscription renewal costs $30 + GST. A tax invoice will be supplied on payment. With your employees in the system, you next upload relevant documentation to support their qualifications and competencies based on their roles. For Signalling, Supervisory, Project Managers and Engineers, this includes documents that have been assessed, approved by an authorised assessor, and endorsed by the relevant Rail Operator. Once the 100 point ID check has been approved by Australia Post, Pegasus will validate the documents uploaded during registration. You’ll be emailed if there are issues with the documentation and given a chance to update the information. 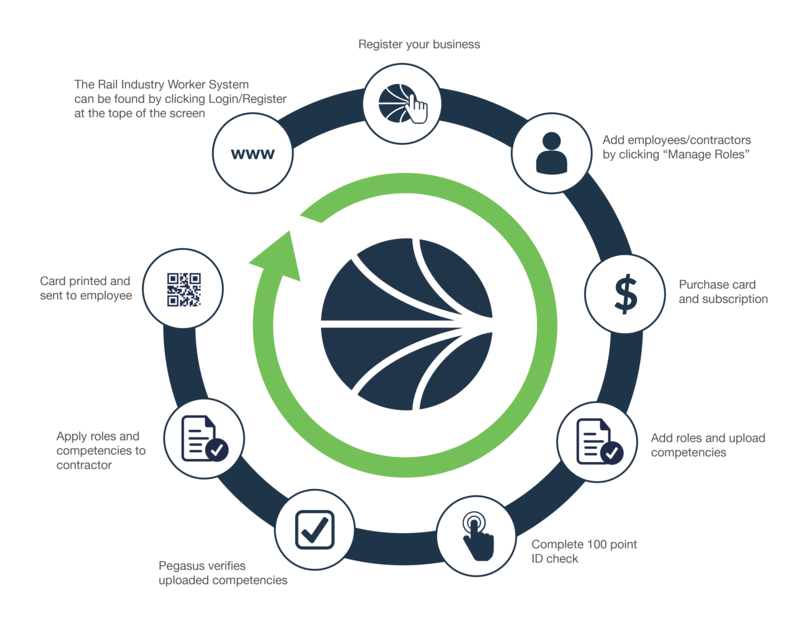 Pegasus will assign the relevant competency to your employee or contractor and approve registration. You’ll be sent a notification to confirm you’ve met the requirements for Rail Industry Worker cards to be issued. Cards will be printed and sent via Australia Post. Please click to view our video tutorials, which will guide you through the RIW process.